Less than five days after leaving Earth atop a blazing Long March launcher, China's Chang'e 3 spacecraft reached lunar orbit Friday to prepare for an historic rocket-assisted touchdown in the moon's Bay of Rainbows later this month. Outfitted with a six-wheeled robotic rover and smarts to avoid hazards in the landing zone, Chang'e 3 is China's boldest unmanned space mission to date, extending feats achieved by a pair of lunar orbiters launched in 2007 and 2010. The craft lifted off Dec. 1 on a Long March 3B rocket, which put the probe on a direct four-and-a-half day trajectory from Earth to the moon. The spacecraft is now flying 100 kilometers, or about 60 miles, above the moon, Xinhua reported. 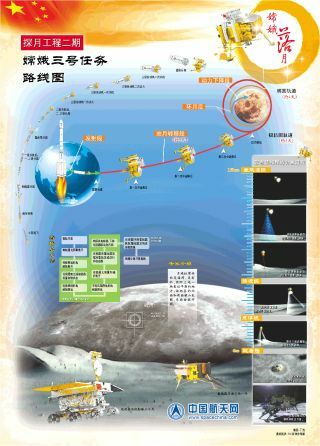 After lowering its altitude later this week, Chang'e 3 will fire a variable-thrust main engine to make a soft landing in the Bay of Rainbows, a dark lava plain on the upper-left quadrant of the moon's near side. The lander has terrain recognition sensors to feed information into the probe's guidance computer, ensuring the spacecraft does not come down on a steep slope or in a boulder field. A few feet above the moon, the lander will autonomously cut off its engine and drop to the surface. Engineers fastened shock absorbers to the landing legs to cushion the impact. China has not disclosed the time of the landing, but European Space Agency officials supporting the mission with communications and tracking antennas say the touchdown is scheduled for some time Dec. 14. Named Yutu or "jade rabbit," the mission's rover will drive off the landing platform a few hours later, according to ESA officials. The rover has a mass of 140 kilograms, or about 308 pounds, and carries radioisotope heater units to keep the spacecraft warm during the two week-long lunar nights. The heaters are likely powered by small quantities of plutonium-238, the isotope of plutonium preferred for space missions, according to respected space researcher Dwayne Day, who discussed the rover's heaters in a story published in the Space Review. The Yutu rover carries advanced radars to study the structure of the lunar crust at shallow depths along its path, and it is outfitted with spectrometers to detect the elements making up the moon's soil and rocks, said Pei Zhaoyu, a spokesperson for the Chang'e 3 mission, in a report by Xinhua. Four navigation and panoramic cameras are mounted on the rover to return high-resolution images from the moon. The mission also has an optical telescope for astronomical observations from the lunar surface, according to Pei. China's lunar program is focused on robotic missions for now, with plans for an unmanned mission to return rock samples to Earth by 2020. China's military-run human space program is focused on development of a space station in Earth orbit around the same timeframe, but scientists have studied a manned lunar mission in the next decade. Chang'e 3 will be China's first mission to test the technologies required for future lunar surface exploration.